What have I been doing, seems like not a lot when I think about it. This weekend we had friends over for dinner, which was fun. This necessitated a trip to the Italian Supermarket, hmmmm yummy. Really not a good idea to go there too often, things are very tempting. Sunday was a nice peaceful day, apart from the gentle reminders to certain people to finish their homework before we could watch a movie, this included me. Yes, I do my homework the day before I go back to class, its the only way I remember what we are studying! 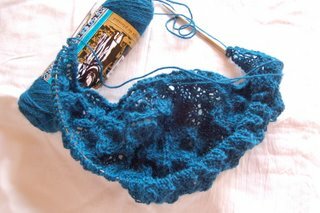 We watched Mission Impossible 3 and I started some new knitting. This may or may not be christmas knitting so I am not saying what it is, the knitters amongst you can make a guess. The christmas socks are coming along, though I am not up to speed with some other people, there is no way I could knit a sock a day. 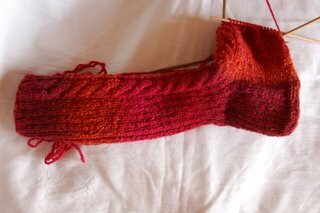 I recently counted the pairs of socks I have knitted, in 2 years I have knitted 20 pairs, maybe next year I will manage one pair a month. The beading is coming along, a bit slowly though, the sale is on Thursday so I really have to move on up a gear….or two. I have 3 more bags cut and ready to sew this morning, if I promise you pictures tomorrow that means I have to do it, so feel free to nag. I think I have cracked a front tooth (grinding my teeth) and I know my dentist is really busy before the holidays, so I am hoping she can squeeze me in somewhere……okay, off to work………. you know…it amazes me at times what you and i have in common. i am also a teeth grinder. especially in my sleep when i am stressed.